The New Teen Titans #20 p. 19 was penciled by the great George Perez and inked by Romeo Tanghal featuring Wally West 11 aka. The KID FLASH thinking & concerned about the New Teen Titan's problem. This page was touched by the super talented artist and only one in existence. This is a Bronze Age original-1982. 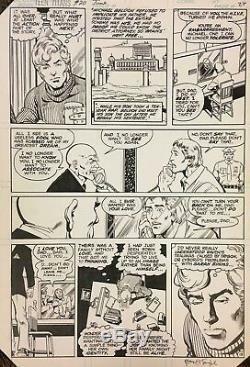 The item "Comic Art OriginalThe New Teen Titans#20 p. 19-George Perez&Romeo Tanghal" is in sale since Saturday, January 26, 2019. This item is in the category "Collectibles\Comics\Original Comic Art\Interior Pages". The seller is "rome-tangh" and is located in Somerset, New Jersey.